ABC have released the official symopsis for April 29's episode of Marvel's Agents of S.H.I.E.L.D., titled "Nothing Personal." 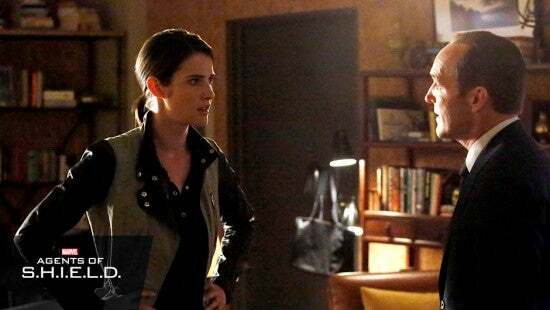 In the episode, How I Met Your Mother and Captain America: The Winter Soldier's Cobie Smulders returns as Maria Hill, a former Agent of S.H.I.E.L.D. now working for Tony Stark. "I think, Maria being the high level person she was, takes the long view," said Executive Producer Jeffrey Bell. "I guess she’s very pragmatic, or [at least] playing pragmatic. So when she shows up and we know that she’s [working] for Stark Industries, in a certain way I think she’s looking for a fresh start and a new way for her to help [the world], a new way for her to be involved, a new way for her to do good. But I think it’s a great opportunity for her and Coulson to be in some conflict because he’s the guy who doesn’t want to let go, and she’s the one that’s clearly moved on." “Nothing Personal” – Just when there’s no one left to trust, Agent Maria Hill (Cobie Smulders) — from “Marvel’s The Avengers” and “Marvel’s Captain America: The Winter Solider” — returns to team up with Coulson as S.H.I.E.L.D. is being destroyed around them, on “Marvel’s Agents of S.H.I.E.L.D.,” TUESDAY, APRIL 29 (8:00-9:01 p.m., ET) on the ABC Television Network. ”Nothing Personal” was written by Paul Zbyszewski & DJ Doyle and directed by Billy Gierhart.